OOTD - Winter Casual Cool | La Petite Noob | A Toronto-Based Fashion and Lifestyle Blog. I love this look! I definitely sport my kicks on the weekend. Practical meets chic, all the way! So glad that you like this look Gabriella! I'm definitely a sneaker convert, and haven't taken them off since this day! 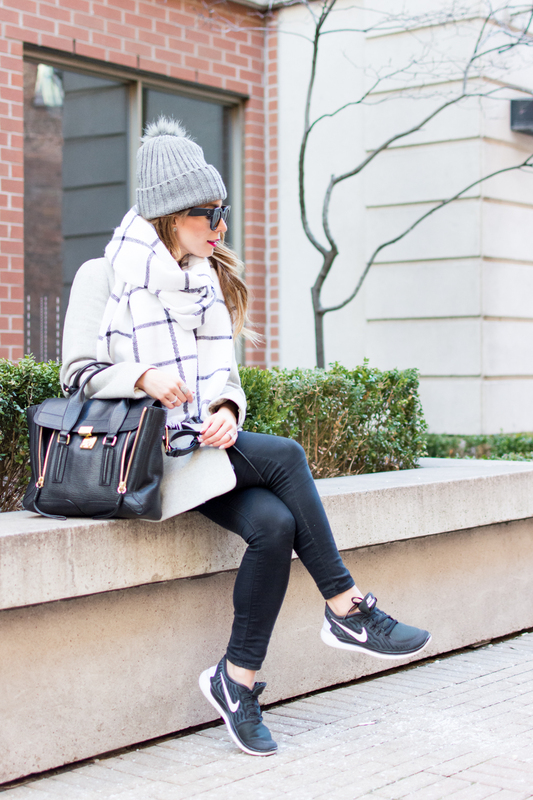 such a cute look, love how the sneakers look with it and your bag is so nice as well! Thank you Danielle, I'm so glad that you like it! You are the ultimate "real" girl and I just love your cool girl outfits! Could not agree more about windowpane print being winter perfect! Stay warm!! Thank you Carolyn! This beanie has been on high rotation lately. Very nice ensemble! Great coat! Thank you Minau! I love this coat too - it's cute AND super warm! LOL I know what you mean Kris - the thought of me wearing these to the gym is pretty hilarious (Gym? Me? Nah.) I'm definitely digging the comfort level of the shoes though, and they're my only salvation from a shoe break-in gone wrong! This is such a great look, and for the record, this is a total "cool person" outfit. It's funny how an outfit can make people think "cool", right? LOL thank you Jackie! I definitely feel like I'm in disguise when I wear this, like "ha ha, if they only knew.." #nerd. Thank you Eleni! 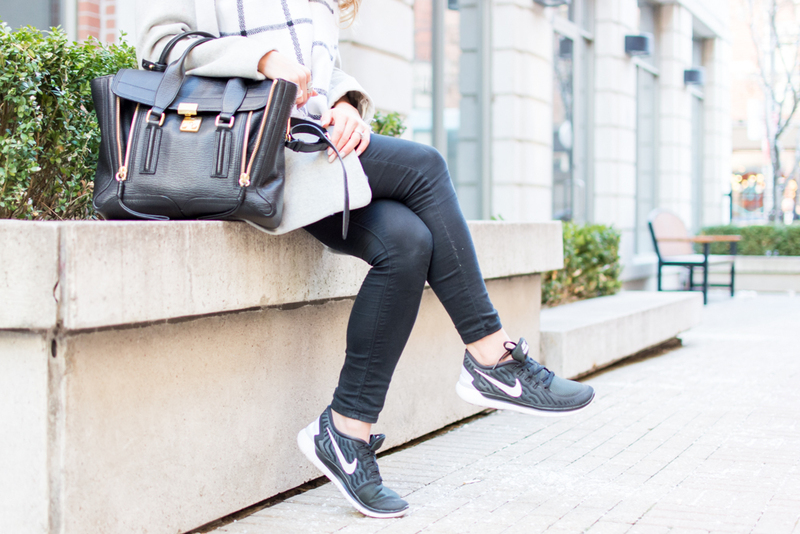 I'm also not normally a huge fan of running shoes with outfits, but I'm LOVING these Nikes - comfort has taken over! Only you could manage to look this cool in the winter! Loving everything about this look! No way Siffat, you have mastered the 'cool' look in the winter! So glad that you like this look! If you want we can follow us each other on bloglovin! So glad that you like the outfit Imna! Your scarf looks so so cozy! Thank you Kierra - it's definitely keeping me warm these days! Yes to band girl life! Band geeks forever!